Also known as St Hildegard, and Sibyl of the Rhine. 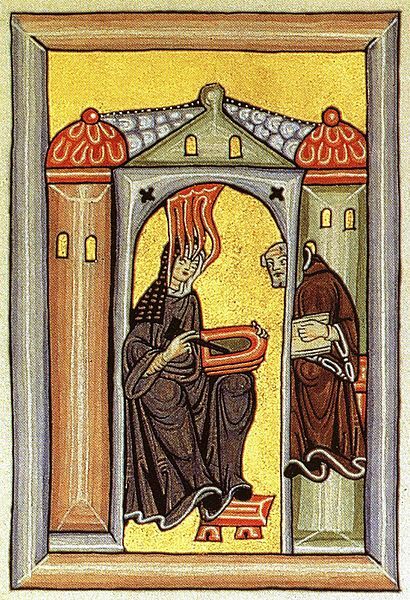 Hildegard was born Sept 16, 1098. She was what is known as a Polymath, a person whose expertise includes a significant number of different subject areas. Leonardo da Vinci, Michelangelo, and Galileo are other examples of polymaths. Among her many interests and accomplishments were: writer, composer, philosopher, Christian mystic, Benedictine abbess, and visionary. She was a sickly child who spent much of her life indoors and alone, during which times she received many visions, one of which, it is said, was fairly detailed description of a calf that was going to be born. She was given the calf she described after it was born. These visions continued into adulthood and eventually she wrote about them as well. She was elected magistra (or leader) of her nunnery in 1136, and founded the convents of Rupertsberg in 1150 and Eibingen in 1165. Although she wrote about many different subjects, it is her work in medicine that I want to emphasize here. One was Physica – about natural science, including information about more than 200 herbs and plants, their harvest, and medicinal use. The other was Causae et Curae – covering 47 diseases, including causes, symptoms, and treatments, as well as 300 plants and their medicinal use. Her methods for healing people included using tinctures, herbs and, precious stones, and combining this with her theological background. Healing also included using the humoural system, which included the four elements: earth, air, fire, and water, as well as: choler (yellow bile), blood, phlegm, and melancholy (black bile). In this system balance of the elements is essential to good health. Plants were used according to whether they were hot, cold, moist, or dry. Although many people who are used to herbs today may think of treating eyes with eyebright, it is Hildegard that is considered to have introduced the use of eyebright as an eye remedy. An unusual woman of the time, she appears to have been quite outspoken… teaching and preaching, with the support of the church. She is also credited as the first woman to write a treatise about feminine sexuality.